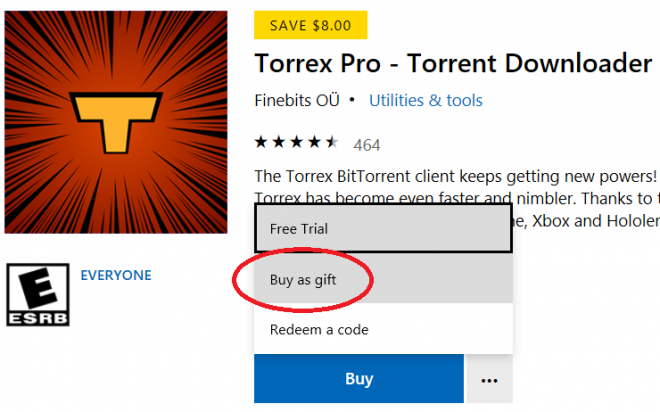 Microsoft started enabling digital gifting of games and content from Microsoft Store in May, but now Microsoft have enabled digital gifting of all types of apps and also in-app buys like avatar items. The gifting process is pretty straightforward, though there are two limitations to be aware of. To buy an app as a gift, a giver goes into the Microsoft app store either through Windows, Xbox, or through the web, and once an app is selected, instead of clicking the Buy button, a giver just has to click the column to the right side of the Buy button instead, and then select the “Buy As Gift” button. The main limitations of the app gifting feature at this point is that the app can only be received in the same country it was bought in, and the app will be delivered to the receiver immediately without the opportunity to decide the delivery time.